Does work have you feeling about 65 million years old? Perhaps the kids have given you a dinosaur-sized headache? For whatever reason you need a well-deserved break, it's time to make yourself a nice cup of tea with this fantastic T-Rex Tea Infuser! Bound to brighten up those dark-agest of days, this terrific tyrannosaurus is made from 100% quality lime green silicone with a metal chain to stop him getting away with your tea. 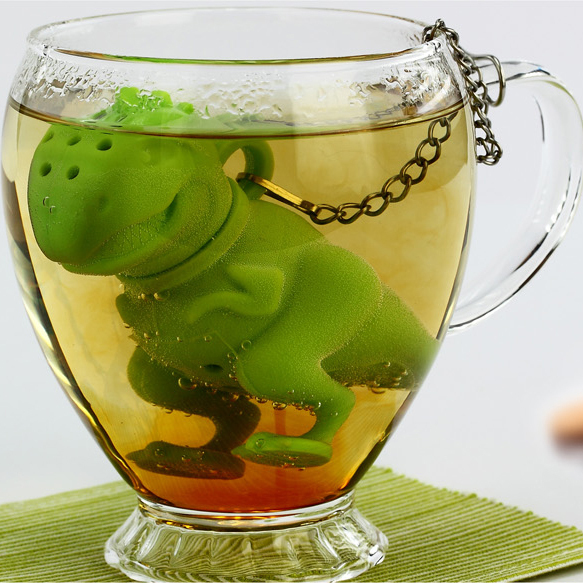 Simply fill this Tea-Rex up with your favourite loose tea, dip in your mug and infuse to your heart's desire! The leaves will have plenty of room to move around within the infuser, and best of all, you won't be left with the gritty leaves that make your tea more of a soup than a drink! Perfect for everyone who needs a break to stop them turning into a ferocious beast. Dimensions: 8cm x 5cm x 3cm.